Can't Get an Apple Watch? Build an Apple II Watch Instead! Can’t Get an Apple Watch? 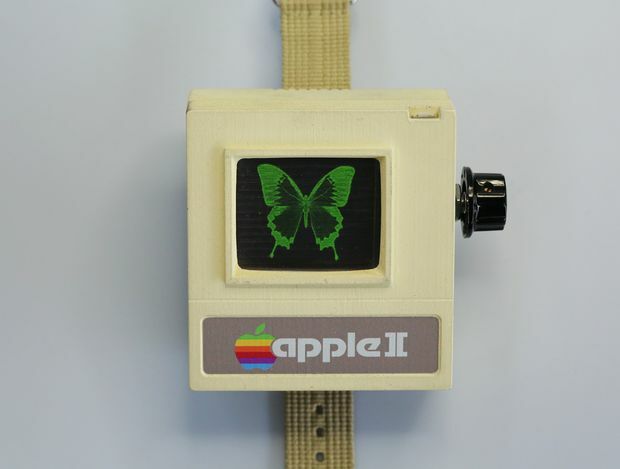 Never Mind – Just Build an Apple II Watch Instead! Apple Watch goes on view today in the US UK and other countries – but not yet in Ireland. But here’s a fun project to design an build an anachronistic Apple II Watch – a device that never was! Amateur electronics designer Aleator777 spent about 3 weeks designing and building his tongue-in-cheek timepiece. He’s even written a sales blurb advertising its availability in “early 1985”. CUPERTINO, California—September 9, 1984—Apple Computer Inc.® today unveiled Apple // watch™—its most personal device ever. Apple // watch introduces a revolutionary design and A BASIC USER INTERFACE created specifically for a smaller device. Apple // watch features A KNOB, an innovative way to SCROLL, without obstructing the display. The KNOB also serves as the RETURN button and a convenient way to PRESS RETURN. The CATHODE RAY TUBE display on Apple // watch features TEXT, a technology that ALLOWS YOU TO READ, providing a new way to quickly and easily access BASIC PROGRAMS. Apple // watch introduces a built-in VERY SMALL SPEAKER that discreetly enables an entirely new vocabulary of alerts and notifications you can HEAR. Apple Computer custom-designed its own 6502 PROCESSOR CUT IN HALF to miniaturize an entire computer architecture onto a PRINTED CIRCUIT BOARD. Apple // watch also features TWO DISK DRIVES to pair seamlessly with your MAGNETIC STORAGE DISKS. Pricing & Availability Apple //w will be available in early 1985 starting at $1299 (US). Apple // watch is compatible with Apple // or Apple // Plus, Apple /// or Apple /// Plus, Apple //c, Apple //e, Apple Lisa, and Macintosh running on ELECTRICITY. Lessons in Simplicity – Apple Inc.